Rich The Kid & Lil Uzi Vert continue to go at each other on social media. The battle for green-haired rapper supremacy as Lil Uzi Vert and Rich The Kid continue to send shots each other's way. Rich and Uzi's beef began when RTK clapped back at an Uzi tweet about signing to a major label as opposed to a rapper or producer, suggesting that the "XO TOUR Llif3" rapper should have signed to Rich Forever. After going back and forth on Twitter, the two brought their feud to Instagram with Rich The Kid claiming Uzi was trying to look like him. 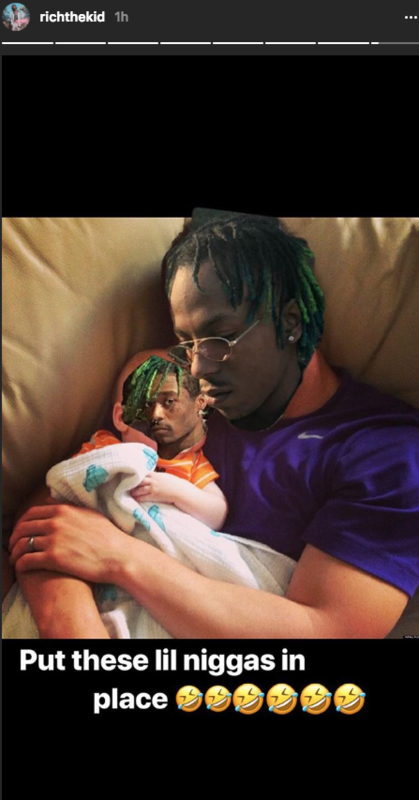 Now, the "Plug Walk" rapper has gone even further, following up on his "son" comments by juxtaposing Uzi's face with a baby's body. While the beef appears to be based on the similar appearance of the two rappers, RTK has been steady clowning his peer by calling him "his son" and previewing a diss track made against the Philly product. Uzi has kept relatively quiet since the beef began, possibly because he's currently on the other side of the world touring Australia. Their fight has been made a little more interesting as it was brought to Rich The Kid's music but will the two ever decide to coexist? Hopefully, we get some solid diss tracks before the two decide to settle their differences, if ever. Check out RTK's most recent addition to his IG story below.